These cloths work great for removing makeup, also are good to wash your face if you don't feel like going through all the hassle of soap and water in the sink! I have combination skin. This was a bit drying on my skin. I had to reach for face lotion right after. It does take of makeup well, though. 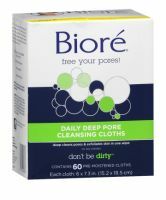 This is the only Biore product I don't like much. These may be good for my pores, but I can't use them without rinsing my face after or using powder to cover up the shine. For my money, I found Ponds and Garnier better.